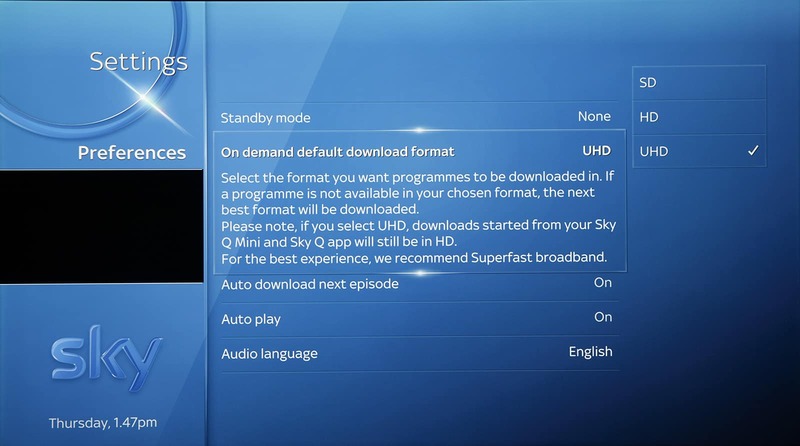 Here is a quick guide to ensure you are properly set up to watch Ultra HD content on the Sky Q service. It covers choosing the correct Sky Q box and subscription, getting a compatible Ultra HD TV and setting the correct resolution and the on-demand default download format on the Sky Q box. For those wishing to watch Ultra HD content with the Sky Q service, getting the correct information is far more confusing that it should be. This is due to not all Sky Q devices supporting Ultra HD and because Sky has recently changed its Sky Q subscription packages. To watch Ultra HD content, you need to have the Sky Q 2TB box (also known as the Sky Silver box, shown above). This is the more expensive of the two main Sky Q boxes currently offered. You will not be able to watch Ultra HD content via the cheaper Sky Q box, Sky Q Mini boxes or iPad and iPhone Sky Q apps. Strangely, new Sky Q customers, or customers upgrading from Sky+, will need a Sky Q Multiroom subscription to be able to view Ultra HD content via their main Sky Q set-top box. Access to Ultra HD content will depend on the exact Sky subscription taken. Sky Sports Ultra HD content requires a Sky Sports subscription, and Sky Cinema Ultra HD content requires a Sky Cinema subscription. Similarly, the Box Sets Bundle is required to watch box sets in Ultra HD. Sky Store content can be rented by anyone with a Sky Q Silver box and an Ultra HD TV. New titles cost £6.99 to rent, and library titles are priced at £5.99. More information about Ultra HD content can be found in our Review of Sky Q Ultra HD. Your TV needs to support Ultra HD content (2160p) at 50fps (frames per second), and have an HDMI port capable of HDCP2.2 (copy protection). On some TVs, not all HDMI ports will support Ultra HD or HDCP2.2, so please check your TV manual. the Panasonic DX902 LED TV (available in 65 inches). You can connect your Sky Q box to your Ultra HD TV with the HDMI lead that originally came with your Sky Q box. 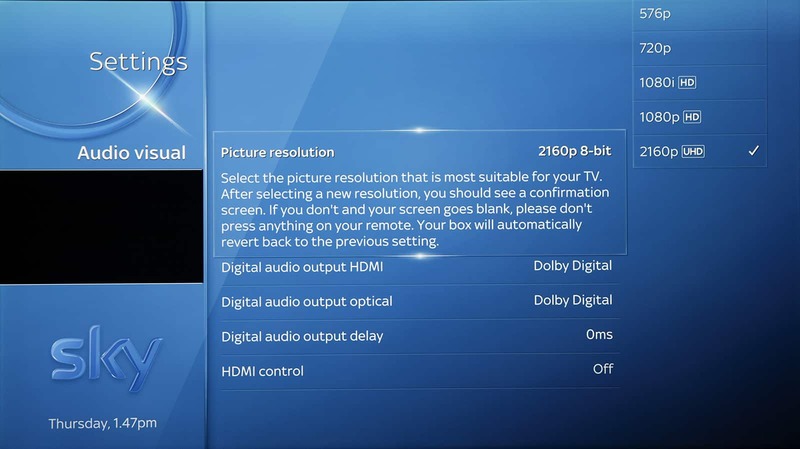 Once an Ultra HD TV is connected, you should ensure that the picture resolution is correctly set on your set-top box. The picture resolution settings can be found by selecting 'Settings' and then 'Setup' followed by 'Audio visual'. 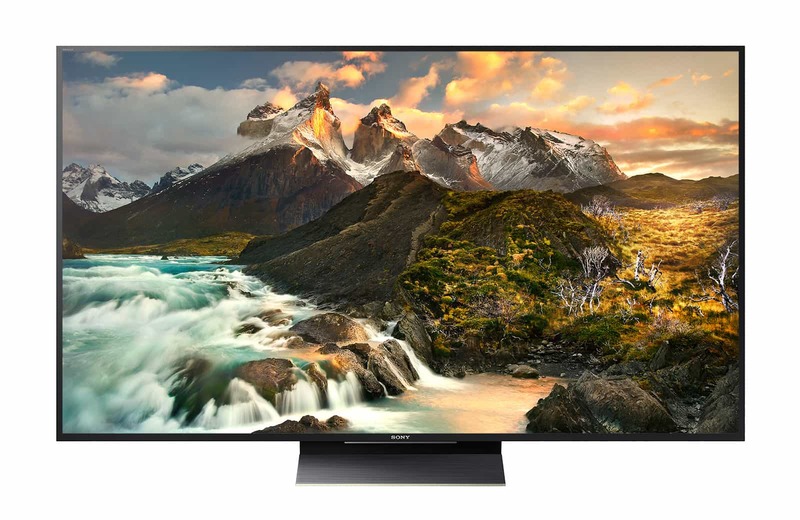 With a conventional HD TV, 1080i or 1080p can be used, but these will not provide the highest resolution when an Ultra HD TV is connected. Make sure you select 2160p. The Sky Q box supports both 8-bit and 10-bit colour and you can manually choose between these, or you can get the set-top box to automatically set the best mode. The 10-bit mode provides superior picture quality, supposedly offering smoother colour gradients, but will only be compatible with the most recent Ultra HD televisions. In some circumstances, if your TV does not support a particular 2160p mode, you may get a blank screen. Thankfully, you can reset the resolution to 1080 resolution by using your remote control and pressing the home button followed by the numbers 1 0 8 0 and then the home button again. Finally, ensure that you select the on-demand default download format to UHD by going to 'Settings' and then 'Setup' followed by 'Preferences'. You are now set up to get the best from Sky's Ultra HD service. Why Do You Need Superfast Broadband? What's Involved in a Fibre Broadband Installation?